Writing today, and the Rite, and I came out of the shrine room floating on the squee of my Mother’s love, despite the fact that I hadn’t quite been able to get all of the story babble out of my mind. She understands. I went to put my jewelry back on, and accidentally (or not) picked up the bracelet that signifies my shrine service to me, along with my Shemsu-Ankh scarab necklace. I haven’t been wearing the bracelet lately, on account of feeling that my service wasn’t all it should be, but in my giddiness I thought, yes, today it seems appropriate, especially since it sort of presented itself to me. I put the scarab necklace down while I put on the bracelet and then my silver pendants. 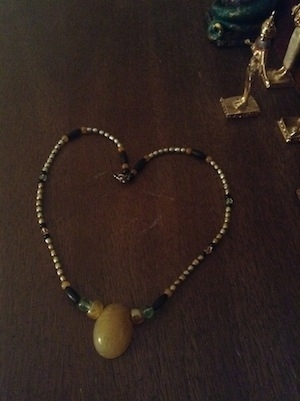 And when I went to pick up the scarab again, and I saw how I’d randomly (or not) put down the necklace. In the shape of a heart. Hail to You my Mother, Mistress of Joy. 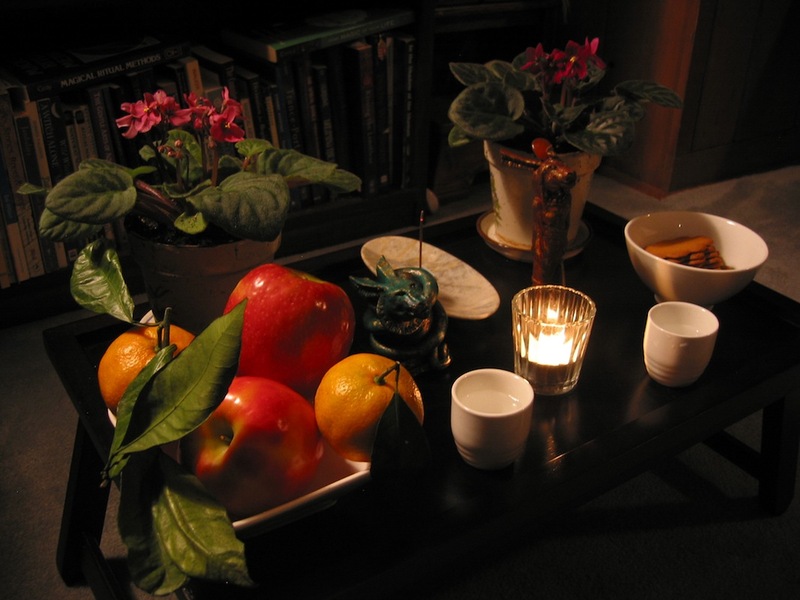 Around the middle of October, I performed a predawn ritual for the Saq-Khmun festival. The focus of the ritual was on a primordial form of Wenut, Wenut at the time of creation — a UPG/inspiration “discovery,” so I have no idea whether there’s any connection to ancient Kemetic myth or practice, but, well, She is definitely a Force. As I described in the earlier post, the ritual was designed to evoke creative energy and to help me get back to writing. And that energy came, all right, but I made two major mistakes: I didn’t have a specific project in mind into which to channel that energy, just a nebulous desire to do something; and I hadn’t addressed what was blocking me from writing. So there was this tremendous surge of creative force that had nowhere to go. I ended up driving around that afternoon for two aimless hours, then went home and went completely mental for the rest of that month. I’m not terribly proud of that period. 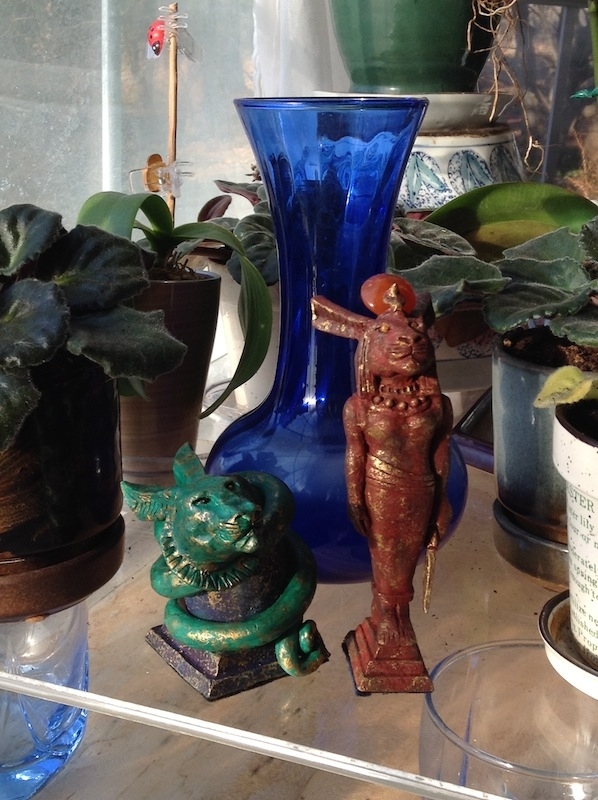 At around the same time as I conceived of the ritual, I commissioned a pair of statues from Nicolas of Shadow of the Sphinx, a primordial Wenut and an apotropaic/Eye of Ra Wenut. It took about a month and a half for us to work out all the details and the statues to be completed; they arrived at the end of November, and on December 1 I welcomed them home with offerings. During the time they were being worked on, I was in a sort of retreat, concentrating on rest and on clearing the way of all kinds of anxiety and overwhelm. By the time they got here, I was poking at some story ideas. And I knew that having invited primordial Wenut into my home, I was going to have to engage with Her power in a more constructive way. This was confirmed when I did a Wepwawet Stone Oracle reading for myself around the end of November. I’d been having that feeling of being stuck in my life, and I asked Him, What should I do about this? Is there Someone I should talk to? How can I move forward? And the reading…could not have been more explicit if glowing words had appeared on the divining cloth. 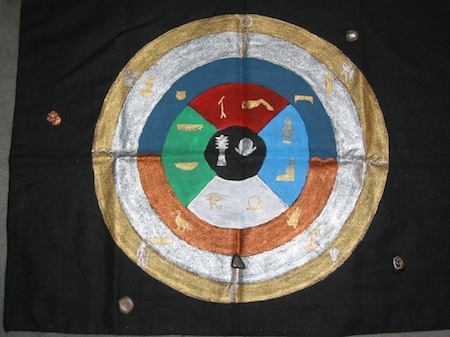 Only one stone landed in the main part of the cloth: the ben-ben, the primordial mound of creation, face down, signifying blocked creativity, lying where Tefnut and Shu, the heart and the mind, are reunited and seek reconciliation. The other four stones all drift in the Nun, the sea of possibility, not currently manifest: the journey toward sweetness (sun barque near Nefertem), perfection’s becoming (four near Khepera), the constructive engagement with the critic-shadow (ibis face down near ram-headed Ra), the fulfillment of service (copper near Atum). Picture of the stone cast (click for larger version). Well. So that was where I committed myself, that writing had to be my priority. And since then, and since Wenut came home to me, I’ve been working, making real progress for the first time in…I can’t even remember how long. I’ve been on part-time priest service for the last couple of months while I figured all of this out. And I’ve been trying to work out where my service is going to go from here. Even before this whole journey of crash and burn and renewal, I had known this: that if for some reason I could absolutely not do both and had to choose one, writing or priestwork, I would choose writing. Some people would probably say that this makes me a terrible and unworthy priest of Bast. But it is what it is. Bast knows, and She has not ever judged me for this. Writing is my service to Her too; She who subsists on joy is made glad by that which brings me joy. So for right now, I’m seeing how well I can maintain with part-time priest service and with intensive writing taking place mainly on the weekends. (Of course, I’m off-pure at the moment, so the balance issue is less immediately pressing.) If I can manage to get back to full-time service that would be a plus, but I’m not going to stress out over it. I’m looking forward to this upcoming year; I think 2014 is going to be a turn-around point for me. It’s definitely going to be dedicated to finishing at least one novel-length original fiction work. (And some long-abandoned but fun fanfiction works as well.) FYI, I do my writing progress reports and other related babble on my Livejournal, if you’re at all curious, though I only started posting there again recently. So anyway — here’s to a year of creativity! Dua Wenut in Your Name of Lady of the First Time! Nekhtet! My two commissioned Wenut statues. Primordial Wenut: head of a lion, ears of a hare, body of a snake, coiled about the egg of creation. Apotropaic Wenut: lion-headed woman with the ears of a hare, carnelian sun disk, and uraeus, holding a knife. There are more and better pictures at Nicolas’s store. He has done some amazing work, but I think he really outdid himself here. I swear, I do not go out of my way to look for really obscure Gods. The Names I already honor must be spreading rumors about me; either that, or I have a psychic door open somewhere. Anyway, a couple of months ago I had one of those moments when I wake up with a Thing in my head. Last time it was the Phoenician Bast Oracle. This time it was something called “star salt.” What it was, I had no idea, but I had to make it. But first, I wanted to figure out where it was coming from. And after a combination of Twenty Questions with the Bast Oracle and some internet research, I finally narrowed it down. It was Opet-Nut. I did make the “star salt,” which ultimately consisted of salt, opalescent glitter, frangipani essential oil, powdered rose incense, and a pinch of natron “to make it brighter.” I offered it to Opet-Nut, then sprinkled it around and in my bed, and fell asleep embraced by the love of the Lady of Magical Protection. Dieter Arnold, The Encylopedia of Ancient Egyptian Architecture (Princeton, NJ: Princeton University Press, 2003). Richard H. Wilkinson, The Complete Gods and Goddesses of Ancient Egypt (New York: Thames & Hudson, 2003), 184. Busy, busy week of Godstuff. Yesterday and today I’m celebrating the Feast of Set, Lord of the Oasis; last night was taken up by a ritual I wrote for Him, which resulted with me spending about two hours in the shrine room talking to Set (or talking at Him, at least), singing songs, making a somewhat laughable attempt at drumming, drinking more alcohol than I’ve ever had at one go (which is, er, half a short tumbler of White Russian — I loathe the taste of most alcoholic drinks and so never have more than a sip, but this was pretty good), and generally doing entertaining human stuff. Set seemed to take it well; at any rate, He seemed very mellow and rather amused. Tonight is the feast part of the Feast: barbecued pork ribs and salad. Yum. I’m also trying to write a mystical short story about Mut for the journal that the House is putting out in connection with its “Queens’ Weekend” celebration later this spring. This doesn’t jibe so well with the Set business, but at least I’ve started it, and hopefully will be able to eke it out later this week. And then this Sunday has four separate things that I want to celebrate: my modern-day Feast of Wenut, for which I’m gleefully appropriating Easter; an acknowledgment of the first day of a new Kemetic month (I Shomu); “Sunset Prayers and Feasts for All the Gods”; and a special Bast…thing. (Unlike the Set ritual, which I’ve perhaps been a little too eager to prematurely share, this one needs to stay under wraps until I’ve actually done it.) I have the general idea of what these are all going to be about, but I need to concretize ahead of time what I’m actually going to do. So there’s planning and writing that needs to be done. Next week is kind of busy too, actually, with a four-day Feast of Amun-Ra (who I really need to give more attention to), another Bast thing, and the Sixth-Day Festival. And then I can fall over the following week. It’s good, though. I’m sure a lot of people out there in the world would totally not understand spending a couple of hours sitting in a room by oneself in the company of a God statue, but hopefully some of my readers here do. In any case, it was definitely worth doing. To get the burning question out of the way right up front: why the heck is this new divination system called “The Phoenician Bast Oracle”? Because that’s what it was called in my dream. In addition to the name, I had a brief glimpse of the tokens that showed the aegis, one of the other signs (I think the eye, although the memory is blurred now), and the purple-and-gold of the tokens’ backs. And then, after waking, there came the fierce, overpowering drive to make this image become. So here we are. But despite these connections, which are all well and funky, I really have no idea why this oracle is specifically the Phoenician oracle. 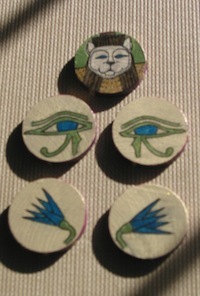 Anyway, the oracle consists of five tokens: two udjat eyes, two lotuses, and one aegis of Bast. There are two ways to cast the oracle — one involves drawing a single token out of a bag, while the other casts all five tokens on the floor and derives meaning from which ones land face up. The former is a yes/no reading that’s very slightly more forthcoming than the Fedw, offering a few more shades of “yes, but,” “maybe,” “no, dammit,” and “I’m not talking to you.” The latter offers a brief statement of Bast’s thoughts on the querent’s question. This expanded version is not nearly as in-depth and detailed as the Wepwawet Stone Oracle, but it’s somewhat more flexible than the Fedw or the Wenut Oracle. As I was poking about the internet to see what I could turn up on Phoenician systems of divination (not very much), I started reading about the use of knucklebones for games as well as for oracles, which made me think that it would be really cool to create a game that used these tokens. Which I did, but, alas, when I used the oracle to see what Bast thought about it, She rejected it. So there will be no playing of the Phoenician Bast Oracle game. If anyone would like to help beta-test this new system, readings are currently free. Just email me at shefyt@firecat.net. I’m back again, after another short posting hiatus. For the main part I’ve been absent because everyone else in the Kemetic blogosphere has been making such great posts that I haven’t felt as though I have anything really significant to add to the conversation. Silly, I know! My energy is picking up again — hello, spring! hello, season of Peret! — and with it I’m hoping to find my voice once more. I’ve been enjoying the Kemetic Roundtable posts, so maybe I’ll take part in the next round of that. My shrine service has been steady since my last leave in December, and this weekend I’ve been winding up a couple of projects. I just finished making a new bag for my Wenut oracle, and tomorrow — Netjer willing and the Nun don’t rise — I should finish making the tokens for yet another divination system. No, I have no idea why the Gods keep downloading these things into my brain. Not that I’m complaining. I’ve also started moving forward with one of my original fiction projects, and I think Bast is also nudging me toward a rather different type of writing project. So there is productivity and progress and various types of activity going on. Speaking of doing things, this is a deep and true post by Elizabeth at Twilight and Fire on how love is an action rather than just a feeling. Elizabeth is a pagan monastic in service to Loki, but what she has to say is wise advice for anyone who serves a God, or indeed serves anything. It has special resonance for me because I struggle with exactly what she describes, the impermanence of feelings or enthusiasms. I’ve had to learn that when excitement flags for one thing and picks up for something else, it’s not necessarily a sign that I should leap to change direction and follow it. Right now I’m finally managing to balance the two things that have pulled me back and forth the most consistently in the last few years — writing and service to Bast. Neither one is lighting me up like crazy, but both are being served. And in that service, there is love, enduring love. And it’s good. In a show of synchronicity, her post ties in as well with my observances of this month’s Procession of Nesret, a festival honoring the Lady of Flame, aka the Eye of Ra. My personal devotion on the actual day of the festival turned on examining what is truly important in my life, while the heka I wrote for today’s Tea with Bast online ritual chat took that further to begin a process of setting specific goals for service to those most essential things. The process is ongoing; it’ll be interesting to see where I am a few months from now. Finally, I’m late to the game, but Rev. Tamara Siuda is running a kickstarter campaign to fund the publication of her Ancient Egyptian Daybook. This is going to be an awesome resource for Kemetics. The initial goal of $3000 has already been reached, but you can still help contribute to the project’s extended goals (and potentially earn pledge goodies). Kemet is rife with creator Gods, and we, their children, are creators too. Our words take on life, the breath of our mouths as we speak or sing or laugh; our hands with their skill give form, color, and texture; our bodies are eloquent in movement, tracing the shapes of our emotions, our patterns of our relationship to the space around us. Even if we don’t necessarily consider ourselves “artists” or “talented” — we write, we draw, we do crafts, we sing alone in the car, we arrange our homes or our rooms or our shrines, we collect things and put them together in ways that speak to us, we weave magic and rituals, we build, code, problem-solve, design, embellish, and adorn. And so much more. In so many ways, we shape worlds, and we fill them with what’s in our hearts. Writing is my own main form of creativity, although I also dabble in various others. Whatever form it takes, though, my creativity tends to be compulsive, cyclical, and all-consuming. I get swept up by what I’ve taken to calling “enthusiasms,” which feel very much like what I imagine the Celtic experience of “fire in the head” must be. (“Fire of the sun” in a Kemetic context, I suppose. Or maybe “fire of Sia.”) Once I’m struck, there’s no letting go until the energy has burned through me. And then it passes, and I don’t quite know what to do with myself until the next round begins. Sometimes it can be exhausting. Especially when I’m working on a song and I end up singing a tune over and over and over waiting for the words to come — my voice gives out, my brain feels hot and raw, scraped by the repetition of half-finished lines, and I just want to whimper, “Please, God, make it stop!” But I don’t really want it to stop. Because then I would miss the extraordinary joy and triumph of accomplishment when the work is finally done and ready for me to let it go. That feeling never dims, never gets old. Each creation is unique in its process, its challenges, its significance. Each one shines with its own light. The work is part of my service, too, to my Mother Bast and all the Gods. 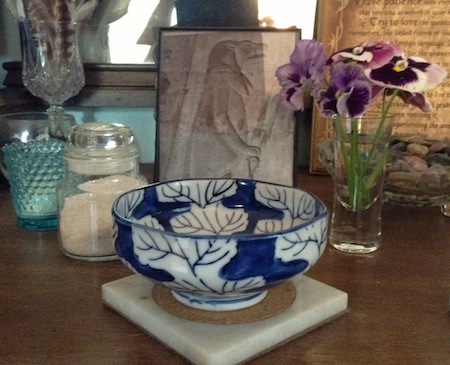 Whether it be songs or poetry, fiction or blog posts, plays or rituals, it’s one of the gifts that I have to offer. I always hope that some reader finds pleasure in it, or insight, or fellowship, or even a moment’s distraction. But even if no one ever read me at all, I think I would still have to dance with the words. For the sake of connecting with and telling the story of whatever it is that inspires me. For the sake of the worlds that want to be born. and on me and you, wherever we go. All You Creator Gods, may You bless the work of our hands and hearts! Dua Netjer! A briefly golden morning, the sun slanting upward through a narrow gap in the overcast east to emblaze hilltops, thinning cloud trails, the highest branches of the trees. A lotus-light, fleeting and magical. Last month I wrote my fiftieth song for the Netjeru. * I’m still a little incredulous at this, considering that I’d never imagined I would be writing songs at all. And it was for Amun-Ra, who started the whole thing nearly four years ago, as I knelt before His shrine and wondered aloud what special service I could do for Him. Sing! He told me emphatically, and from that moment, that first awkward, self-conscious rendition of the House of Netjer classic “Ankh, Ujda, Seneb,” which was the only vaguely appropriate song that I knew at the time, has somehow arisen a whole repertoire of songs for many different Gods and festivals. The sources of creativity are certainly mysterious! But it makes perfect sense that it would be Amun-Ra who set me on this path. As the syncretism of Amun and Ra, He’s always seemed to me an embodiment — an en-God-ment? — of the creative process itself, the journey that extends from the Hidden to the Manifest, from the first leaping electricity of connection and inspiration to the particular luminosity of the finished work. And now that I’ve been reminded of this, I plan to offer my nonmusical writing projects to Him and to seek His help in getting those off the ground as well. Dua Amun-Ra, Lord of the Hidden Wind, Lord of the Radiant Sun! May You bless all the works of my mind and imagination! 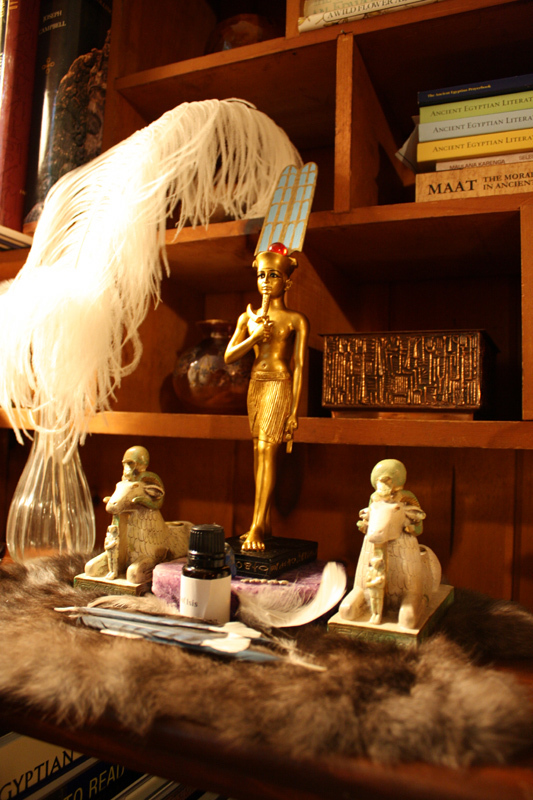 Photo of my Amun-Ra shrine, with the statue featuring the new plumes that I *finally* made for Him this past summer (detail; click photo for the full shrine.). * And in the time it’s taken me to get around to writing this post, I’m already up to song #53. Note to self: Life does not stand still and wait for you to blog about it.